How do you get that striking neon yellow inside effect? Enter Panyl, a fabulous new product that allows you to transform plain vanilla furniture into something poppy and fun. Panyl is a self adhesive covering that comes in all sorts of colors and styles. You just cut, peel, stick, smooth. Today, I’m featuring a DIY guest post from Dan Goldman and Tristam Steinberg that shows you exactly how to transform that brand new white Kallax into something truly eye-catching. See the full step-by-step at the end of the post. Any of these above versions could have received a little dash of color with the help of Panyl! One thing I love is that Panyl comes pre-cut for many of IKEA’s best sellers. 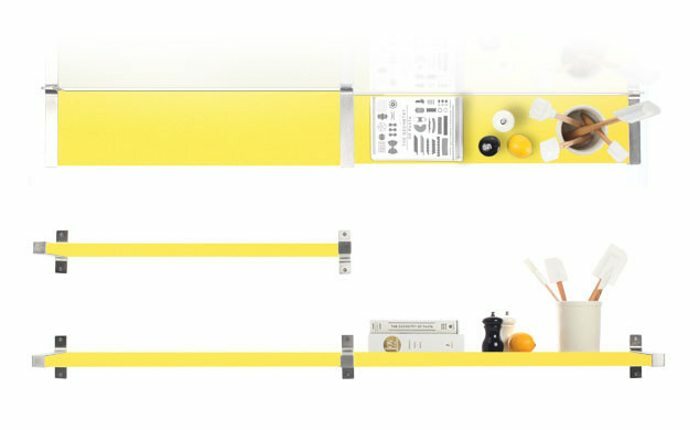 If you love that day-glo, lemon drop yellow, order it for the Ekby Jarpen shelves and you start to have a whole room working for you that is modern, fresh and fun! Cover virtually any furniture front in whatever color you want. 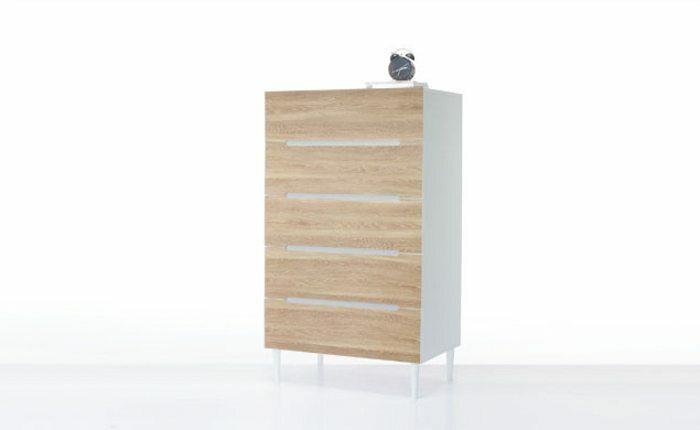 Here is the Sveio Dresser in Pale Oak woodgrain. Personally, I love the Malm desk in Robin’s Egg Blue. Can you see me twirling in my plexiglass office chair cushioned by a fab bit of white sheepskin? :: Identify the inside faces of the Kallax frame; Using the guidelines on the back of your Panyl and a sharp blade, cut Panyl to each pieces approximate size, leaving a little extra on all sides. :: For each piece, line up one end of Panyl to corners of Kallax piece. :: Line up Panyl to piece. :: Adhere Panyl to Kallax piece, matching the corners. :: If Panyl doesn’t line up, simply pull up Panyl. :: Smooth out all bubbles. :: Using the edge of the Kallax piece to guide your blade, trim away excess. :: Find the dowel holes by pressing down with your finger tip to expose them, and cut holes out with your blade. :: Sand edges of each piece. :: Repeat process with each inside face of the Kallax shelf. :: Assemble shelf according to IKEA directions. Ikea furniture has never really appealed to me because of the “vanilla” factor, like you said, but I’d actually consider buying one of their bookcases if I could jazz it up this way! I love it! What a fascinating idea, it really makes it pop.